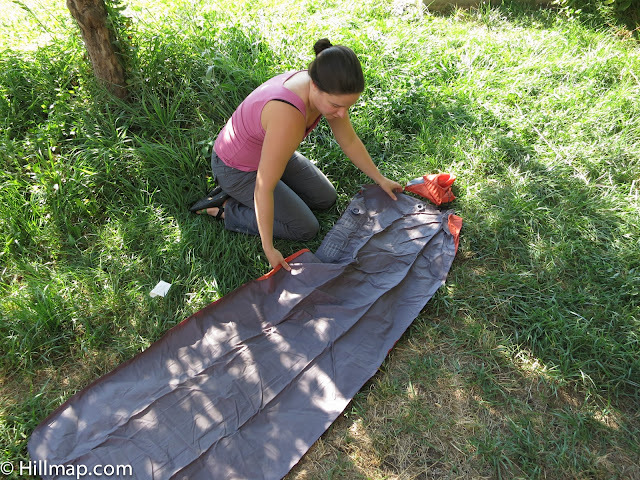 Huffing and puffing into an air mat is one of my less favorite parts of camping, but I wouldn't trade the lightweight comfort and warmth for any other option. 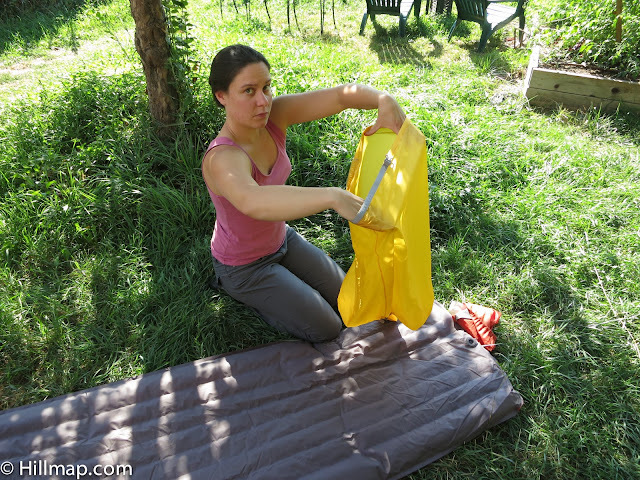 Many people feel like I do, and the camping pad companies have responded with a variety of solutions from battery powered fans to self inflating mattresses. I have been sleeping on an Exped Synmat 7 for the last few years and absolutely love it. This mat has two different options for lungless inflation. 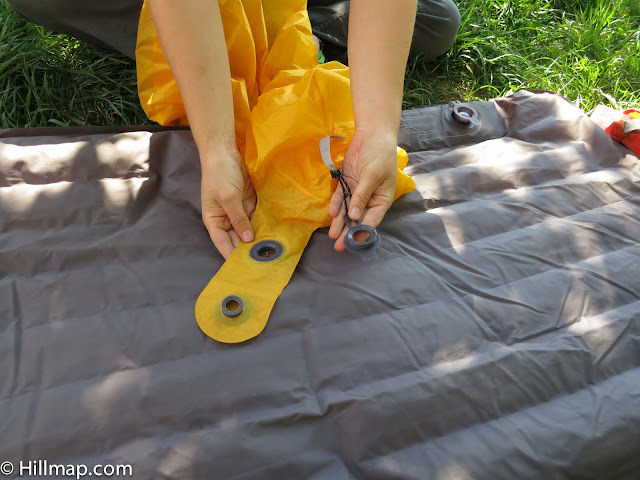 My parents just purchased the excellent Big Agnes Insulated Air Core, and there are a couple different methods to inflate this pad. Methods described below. Both pads are air mats filled with primaloft, and are similar in their warmth and cushiness. 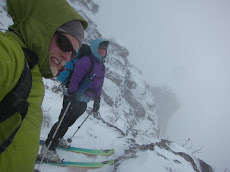 The Exped has a few more features. The Synmat 7 is one of two models of air mat that Exped builds with an integrated hand pump. 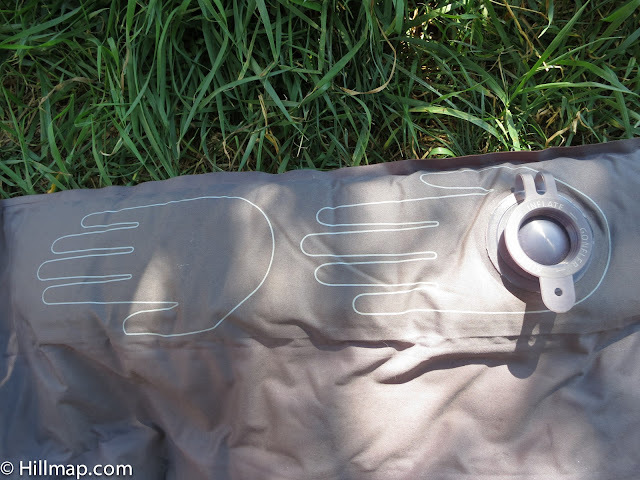 They just came out with an even lighter version, the Exped UL Synmat (but no integrated pump). 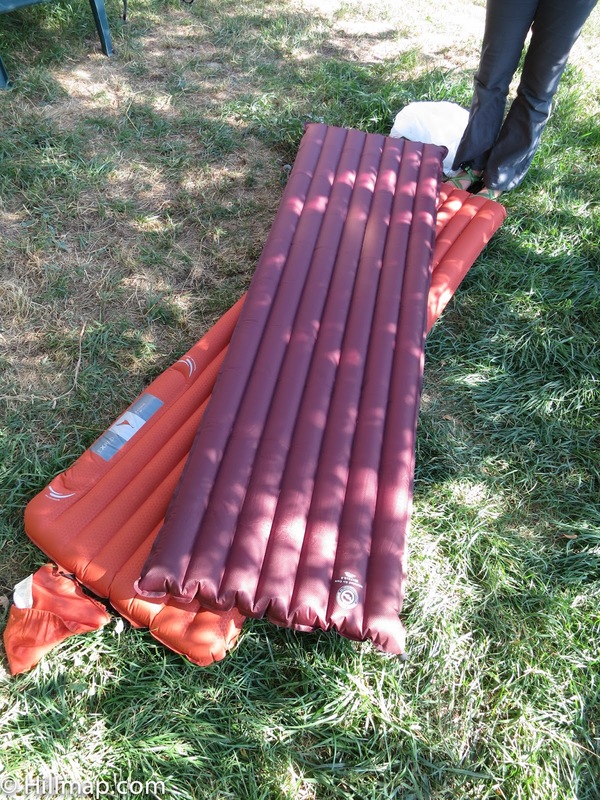 The pump is a one-way inflation valve and foam pump located on the bottom of the mat. The one way valve makes inflation less fussy as no air is lost between pumps. The hand pump is not a fast inflation method, and feels a little bit like performing CPR as you push air into the pump with your hands. It does warm me up on chilly nights, and I don't feel light headed (as I do after inflating an air mat with my breath). I much prefer the hand pump to blowing up a mattress, but I prefer the schnozzel. 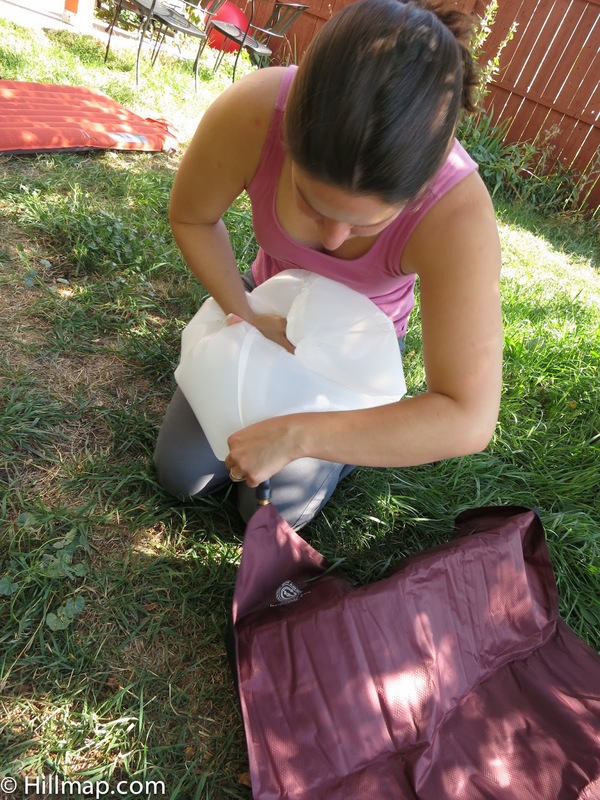 The Schnozzel Pumpbag is a diaphanous silnylon stuffsack with a valve on one end that is compatible with Exped air mats. You need an adapter to make it compatible with mattresses with an integrated pump (like the Synmat 7), and it is not compatible with other air pads. Ignore my expression, please! Filling the schnozzel with air just requires you to open and close the bag. Simply fill the bag with air by closing the top, and then squeeze the bag, pushing air into your sleeping pad. This method is slightly faster than the hand pump for me, and only requires four or five bag fulls to inflate my mattress. I am able to fill my camp pad until it is firm and no more air will enter through either the schnozzel or the integrated pump. The pad will loose a little bit of volume due to cooling temperatures between the time I fill it and when I go to sleep, and it is easy to top it up before bed. However, because the pump is on the bottom of the mattress, it is difficult to top up in the middle of the night without waking my tent mate. The schnozzel can also be used as a stuff sack, and as a pillow when filled with some air and the valve and top are sealed. 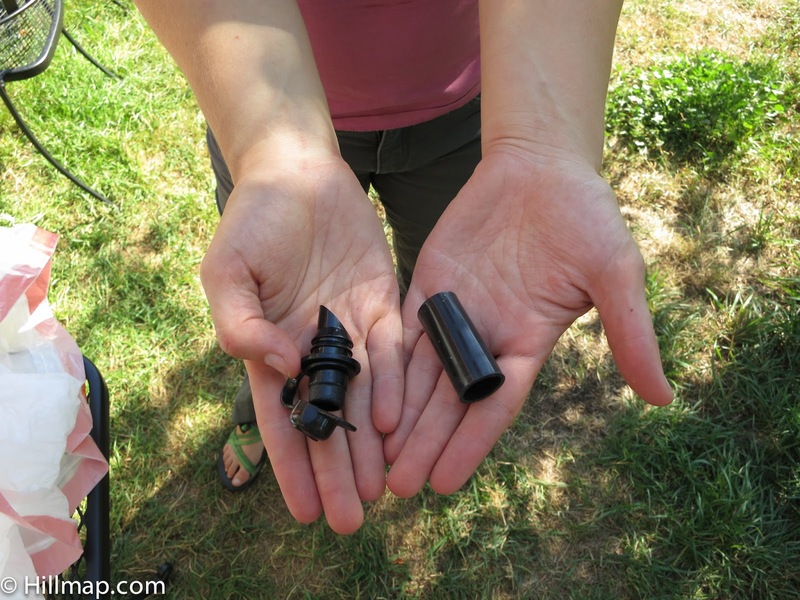 The NeoAir Air Tap Pump (see photo at top of post) is a small two-part valve that is compatible with Thermarest, Big Agnes and other air mats with an air valve intended to blow into. You can attach the air tap pump to any air tight bag, I chose a garbage bag. A large stuff sack would be more durable and stand up to the pressures of squeezing longer. Either cut a small hole or stick the pointy end of the valve through one of the bag's bottom corners. Thermarest also makes a pump bag with a reinforced hole for the air tap valve. Turn the bag inside out and slide the rubber gasket over the pointy end of the valve, with the bag sandwiched between. 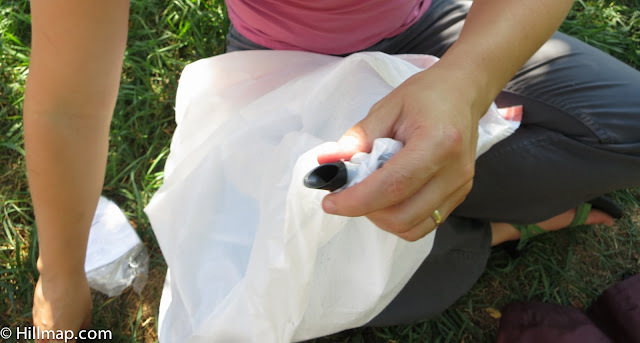 If you are using a stuff sack, you can get a better seal by gluing the valve and gasket to the bag. The seal is fine without glue. Double check to make sure that the hole in the bag is free and clear, otherwise inflating the camp pad will be much slower. Slide the gasket over the air mat's inflation valve and make sure that the valve is open. Fill the bag with air, and then close the top by twisting or rolling and squeeze air into the mattress. This kind of inflation valve on the camp pad is a two way valve, which makes your job a bit harder. As soon as the air pressure inside the mattress is greater than the air pressure outside, it wants to deflate. At this point I find that I really only need one about one large bag full to make the pad firm. 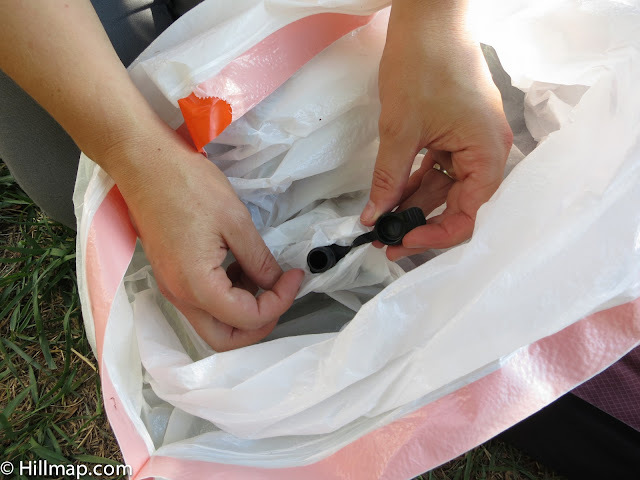 You can use the cap on the valve to shut off the air flow while you are refilling the bag. The cap on the valve can be useful between refills when the bag is approaching fullness, however, it also wants to close itself while you are squeezing the bag to fill your mattress. I solve this problem by gently pinching the cap with my thumb through the garbage bag while I am squeezing the bag to keep it from blowing shut. The Air Tap Pump system will mostly fill the camping mat, but I like a bit of a firmer pad and need to add a couple breaths to make my mattress as supportive as I like. Thermarest also makes a NeoAir mini pump that is essentially a small fan that attaches to your mattresses inflation valve and fills up the pad. Weighing in at only 2.3 ounces, it may be a good solution to eliminate work to inflate your mattress, even when backpacking. The reviews I've read say that it works pretty darn well, but you still do need to add a couple breaths to achieve a firm mattress. Big Agnes makes their own version of the schnozzel, the Pumphouse. I'd love to give it a try and see to what extent it makes it easier to keep the pad from deflating. The Instaflator is another option, similar to the schnozzel and Pumphouse. The bag itself is very long, so it will take fewer bag fulls of air to inflate your pad. (Worth looking at, but just to be warned, when you click on the link loud music blares). If you're looking for a sleeping pad that requires absolutely no lung power, the Exped with integrated pump is the best way to go. The one way valve is designed to keep air pressure in the mattress during inflation without fuss. The schnozzel cuts down the time & work it takes to inflate the mat. The two-way valves on the Big Agnes and the Thermarest are designed for at least partial inflation by mouth, and your mouth and tongue are efficient at stopping the backward flow of air between breaths. This makes a pump system a bit more fussy. If you don't mind adding a couple breaths to make your pad firm enough to sleep on without feeling every bump on the ground, then the Air Tap Pump, Instaflator and Pumphouse are really great, lightweight systems that will save your lungs quite a bit of effort. In this case, find a good deal on a comfortable pad and you'll be happy. Another benefit of inflating your air mattress without breath is that it introduces less moisture into your mattress. Your breath is full of moisture that can shorten the useful life of your air mattress. Also, here's a fun graphic by Exped that helps you choose which camping pad is right for you. The Intex Comfort Dura-Beam Airbed is a good example of what you can find today, and it won’t put a huge dent in your wallet. This queen-sized air mattress is almost regular bed height at 22 inches. The bed inflates quickly because it includes a built-in electric pump, so no one’s going to wear themselves out with a manual pump.